Whether you enjoy them on the half shell, fried, or prepared in a completely unique and innovative way, oyster options abound in Maine. It’s no secret that the state is a formidable force in the seafood scene and these restaurants will show you exactly why. Here are the 10 best places for oysters in Maine! Located on Badger’s Island, the Pointe serves up fresh Maine oysters on the half shell. Enjoy a few with cocktails or as the perfect appetizer. The fried oyster platter at Billy’s Chowder House is huge—and delicious. If you’re not a big eater, you might consider sharing with someone at your table. The meal is to die for! Serving up oysters on the half shell and a fried oyster entrée, everything served at Boone’s is remarkable. Relying on the seafood itself to be the main flavor, everything is seasoned perfectly so as not to overpower the food. Start with an appetizer of Maine farmed oysters on the half shell, and then enjoy an entrée of fried oysters with all the fixings when you visit Robert’s Maine Grill. Their seafood is always fresh and their service is impeccable. Repeat customers visit The York River Landing for oysters on the half shell and cocktails—often staying for dinner, too. They claim the oysters here are the best they’ve ever had. If you’ve never treated yourself to Oysters Rockefeller, then it’s time to visit Galyn’s in Bar Harbor. Baked with creamed spinach and Pernod, and topped with crisp parmesan, panko and bacon, it’s a treat for the several of the senses. 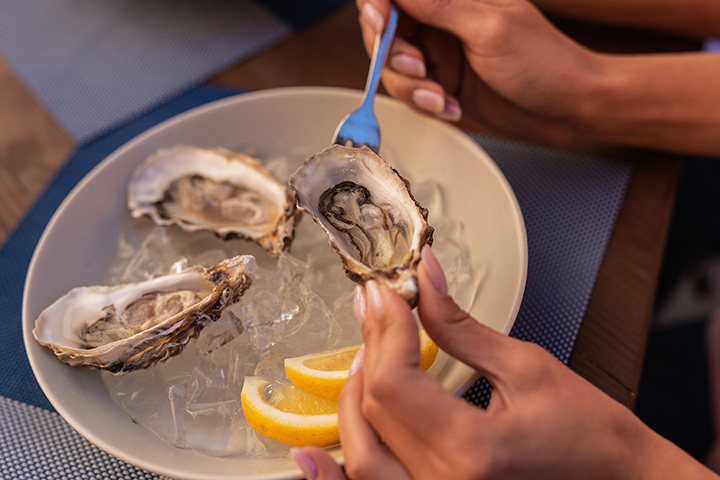 Whether you order the oysters on the half shell or the fried oysters entrée, you’ll treat your taste buds at Waterfont. A Camden classic, the seafood is fresh and the ambience is worth every penny. For the biggest selection of oysters you’ve likely ever seen, visit Eventide Oyster Co. Featuring a dozen from Maine, including Winter Point Selects and Norumbega, as well as a half dozen from “away,” their assortment is vast. Your server will explain the differences before you order up a few dozen for your table and slurp the night away. The oyster stew at Docks Seafood is something to behold. Rich and flavorful, it might fill you up. Try to save room for their fried oysters, too, which are equally as spectacular. The oysters don’t get much fresher than those enjoyed at Old Port Sea Grill. Eaten straight from the shell with a dash of lemon and some cocktail sauce, the delicacies are excellent when paired with a crisp Pinot Grigio.